Apple introduced the Retina display back in 2012 on the third-generation iPad and hasn't increased the resolution since. What's amazing however is that now we get the same high resolution in a compact sub-8-inch tablet. The competition may have 10-inchers with higher resolution, but in the compact segment, the iPad mini screen resolution is as high as it gets. In a stark contrast to last year's iPad mini, the new screen is incredibly sharp. The number of pixels has been quadrupled (3.1M pixels vs. 0.78M pixels) and the mini has doubled the pixel density of the original (324ppi vs. 162ppi). Now, it's really hard to spot the individual pixels with your bare eyes and even the smallest of fonts look clear and legible. The pixel arrangement on the LCD matrix is the same as on the iPad Air - you get a standard red, green and blue pixel side by side. Looking at the numbers the iPad mini 2 stacks pretty well against the competition. Its contrast is not the best we have seen, but the colors are nicely rendered and the viewing angles are very decent for a tablet.. The iPad mini 2 is equipped with a 45% more battery capacity than last year's mini (23.8Wh vs. 16.3Wh) just so it can achieve the same manufacturer rating of 10h of runtime. Well, manufacturer ratings are never to be taken at face value, so we did our usual set of battery life tests to see how the iPad mini 2 stacks up against the competition. We are happy to report that the Apple iPad mini 2 did more than enough to live up to Apple's claims and then some. The slate managed a 10:47 hour run in our Wi-Fi web browsing test. That's nearly 40 minutes more than the iPad Air, but it should come as no surprise - the mini 2 has a much smaller screen and the chipsets are almost identical (save for a small difference in clock speed). More importantly, the improvement over the original iPad mini is over an hour and a half. 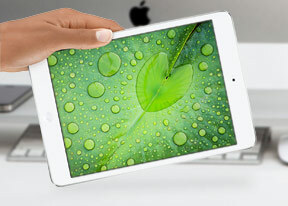 The big iPad Air comes out ahead of the iPad mini 2 by half an hour in our video playback test. This test doesn't stress the CPU, so the bigger battery of the Air managed to feed the bigger screen slightly longer. This score is also half an hour less than the original iPad mini. Still, for all intents and purposes the two Apple iPads have the same battery life. Compared to the original iPad mini, the mini 2 shows tangible improvements in the web browsing department and a slight regression in video playback. More importantly, Android tablets struggle to outlast the iPad mini - the Samsung Galaxy Note 10.1 2014 Edition is behind by 3 hours in both tests and the Asus Transformer Pad is 2 hours behind, coming out ahead only when attached to its dock (which has an additional battery).